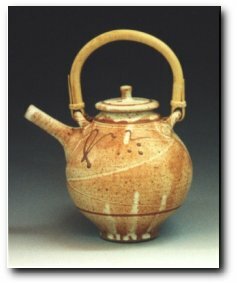 One of my favorite pots to make is a teapot. I wish I could say I always have a few around in the shop, but such is not the case. Once or twice a year (sometimes more often), I will make a series of eight or ten, just for the challenge. It's usually in January or February, about the time I'm ready to get back in the swing of things after taking a little Christmas break. Coming on the heels of the seasonal rush, and dinnerware production, it's a nice change of pace. If you are ever near our shop in Seagrove, NC, stop on in. We are open (pretty much) Mon-Sat, 10-5, year round. If you are coming from a ways away, please call or e-mail first. I hate for you to make a special trip, and not be here to greet you. Who knows, maybe there will be a couple of tea pots on the shelf! If not, I'm sure you will find something of interest.